Although some of you may think iPhones are as old as Adam and Eve, these modern era communication and computing devices have been with us for only about seven years. But much has happened (a lot of it in the U.S.) in those seven plus years – Apple sold nearly 600 million iPhones, reaped tens of billions of dollars in profits, became one of the most admired companies, its phenomenal success contributed to Microsoft CEO Steve Ballmer being thrown out and buried Steve Jobs. In the same period, I’ve watched hundreds line up for the latest iPhones outside Apple and AT&T stores, witnessed 14 and 15-year-old McDonald’s workers toying with their latest model iPhones, listened to 65-year-old fogies boast about gifting iPhones to their girlfriends and gone through three iPhones myself. Oh yeah, I’ve seen Chinese people alighting from tour buses in droves at the nearby mall to buy tax-free iPhones to send them to eager buyers in China. But while the rest of the world is going gaga over iPhone 5, 5S and the large screen 6 and 6 Plus, Indians have resolutely raised their collective middle finger to the iPhone. That must be extremely distressing to Apple since India is still largely a feature phone market. At the end of the third quarter, smartphones accounted for 32% of the Indian mobile phone segment with feature phones taking the rest. Apple just can’t get those thrifty Indians to open their wallets to the pricey iPhones. In desperation, Apple dumped an iPhone dinosaur (the 4s model) with a measly 6GB of internal storage on Indians last year for $350. Indians sneered at the move and purchased more Android smartphones. Even as Apple continues to report growth in most geographies, India (with 1.2 billion people and potentially the single largest smartphone market in the world) has been a colossal disaster for the company. In the third quarter of 2014, India was the fastest growing market in Asia/Pacific with a quarter-on-quarter growth of 27%. 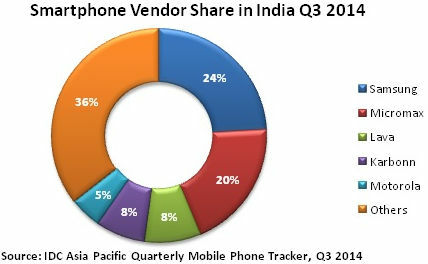 Indian consumers snapped up 23.3 million smartphones and 49.2 million feature phones in the quarter. But what’s embarrassing for Apple is that it’s not even among the Top Five smartphone vendors in India. In short, iPhones in India are like Microsoft’s Windows smartphones in the rest of the world – A completely irrelevant player with insignificant marketshare and little prospects in the near term. The single biggest reason that Apple has failed in the Indian market is pricing. The majority of Indians can’t afford to splurge $600-$800 on iPhones. Unlike in the U.S., smartphones in India are not subsidized by carriers in exchange for lucrative two-year contracts. As a result, price-sensitive Indians have embraced low-priced Android smartphones in a big way. It’s safe to say that Apple has also neglected the Indian market since there’s been no shortage of buyers in other parts of the world. But as other markets mature and the smartphone replacement cycles grow longer, Apple’s failure in India will be seen as a huge negative for the company. Adding to Apple’s woes, Chinese smartphone vendor Xiaomi has been attracting considerable buzz and interest for its smartphones and phablets from Indian consumers. With 24% market share, Samsung continues to be the smartphone leader in India although its growth in the third quarter was lower than the industry average. The third quarter turned out to be another strong one for Micromax, which grew its share from 18% in the second quarter to 20% in the July-Sep quarter. Lava and Karbonn had 8% share each in the third quarter while Motorola had to be content with 5%. Apple (iPhones), Microsoft (Windows Phone) and a gazillion other players accounted for the remaining 36% of the Indian smartphone market. IDC is projecting the Indian smartphone market will exceed 80 million in 2014, a solid growth from the 44 million units sold in 2013. Shortages Persist for 64GB iPhone 6, 6 Plus Are Ubuntu Phones Doomed?